If only I could attach the iPhone to a tripod! Well, this is where the Glif comes in. It’s a small piece of moulded plastic that has a standard tripod screw hole at the bottom, and that grips the iPhone securely. You can use it on a full-size tripod, and it works very well, but it does look quite silly. I find it much more useful to use a mini tripod instead, so I can literally carry me entire video setup in my pocket! 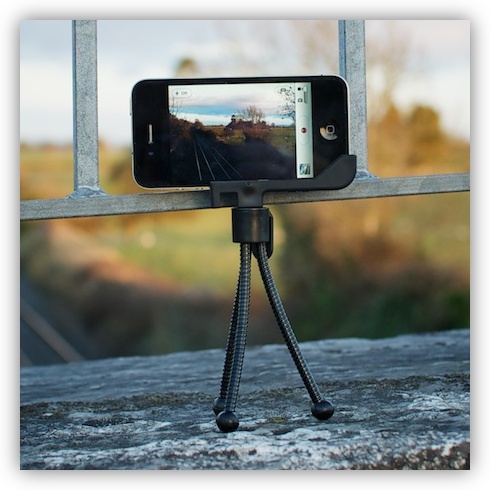 As well as acting as a tripod adapter for the iPhone, the Glif can also function as a handy little iPhone stand, in a surprising number of configurations. If you’re curious about what all the Glif can do, they have a nice little video on their site. The Glif is $20 + shipping, which is quite steep for a simple piece of plastic, but I have to say, I’m very happy with it, and I’m certainly getting good value for money out of it.